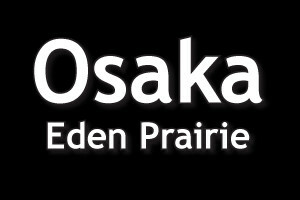 Valid at Osaka Eden Prairie Location only. May not be combined with any other offers, specials , coupons or with happy hour menu. Not valid on Holidays. Dinner hours 4:30 - close. Valid at Osaka Eden Prairie Location only. May not be combined with any other offers, specials, coupons or with happy hour menu. Not valid on holidays. Dinner hours 4:30-close. 30-50% OFF Sushi All Day Long!